Aqua Fantasy Aquapark Hotel & Spa on Pamucak beach in Turkey’s İzmir is a perfect destination to spend a fun-filled family holiday. 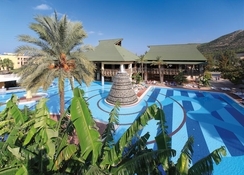 The five-star hotel is situated inside the complex of the Aqua Fantasy Aquapark – an award-winning water park. Located on the Pamucak beach washed by the Aegean Sea and back by pine-covered hills, the cheerful hotel is celebrated among families, couples and large groups of travellers. The hotel offers cosy and comfortable rooms that are decked out in contemporary design and all the necessary amenities. With 7 restaurants serving culinary creations of various parts of the globe and 9 bars, Aqua Fantasy Aquapark Hotel & Spa is sure to treat your palate. The state-of-the art spa offers massages, sauna, Turkish bath and a variety of body and facial care treatments. The hotel also features half a dozen of outdoor and indoor swimming pools, fitness centre, kids’ club, playground, outdoor sports, indoor games and evening entertainment shows. The kid-friendly Aqua Fantasy Aquapark Hotel & Spa is located between Ephesus and Kusadasi (8 km from both places) on the Pamucak beach in Izmir. With the beach right across the hotel and the water park in the same complex, the hotel is an ideal destination for water sports activities on the sand as well as unlimited water fun for children. The Kusadasi town centre is just a 15-minute drive (9 km) from the hotel, while the Izmir Adnan Menderes Airport is 70 km away. There are a number of sightseeing attractions around the hotel, including the archaeological site of Ephesus, Artemis Temple, Virgin Mary’s House and Sirince Village. Built amidst a huge landscaped garden and an exciting water park, Aqua Fantasy Aquapark Hotel & Spa offers comfortably furnished guestrooms. The rooms are divided into two sections, World Hotel and Club Hotel, and each consists of various categories of rooms. World Hotel offers Double Rooms, Large Double Rooms, Deluxe Rooms and Family Rooms, while Club Hotel provides Double Rooms, Family Rooms and Family Suites. All the rooms are furnished with modern amenities and feature private balcony with views of the sea, garden or pool. Facilities in rooms include air conditioning, private bathroom, shower, bathtub, mini bar, Wi-Fi, TV with satellite, safe, telephone, tea and coffee making facility and more. The Deluxe Rooms – ideal for couples – have a Jacuzzi and a DVD player. 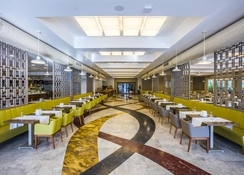 There are a clutch of delightful restaurants serving a broad range of cuisines at Aqua Fantasy Aquapark Hotel & Spa. 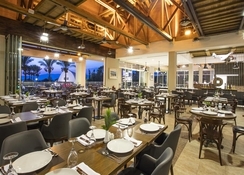 Tropicano Restaurant and Oasis Restaurant are the two main restaurants that serve breakfast, lunch and dinner in buffet style. 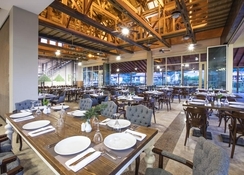 There are 5 a la carte restaurants: Mario´s Restaurant offers Italian cuisine, Meze Restaurant serves Turkish dishes, Marine Restaurant has fresh seafood choices, Mandarin Gourmet prepares Chinese and Asian delgihts, and Pirate’s Steak House has succulent steaks on offer for meat lovers. 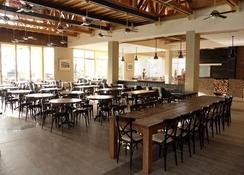 The hotel also features 9 bars and lounges that spread across the complex. There are Atlantis Bar, Pearl Snack Bar, Caribbean Snack Bar, Flamingio Pool Bar, Fontana Pool Bar, Lobby Bar, Beach Bar, Atrium Bar and Disco Bar. 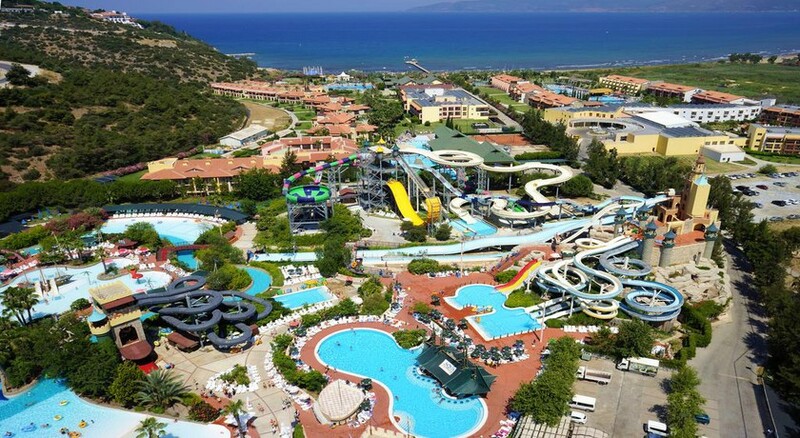 The best attraction at the hotel is the Aqua Fantasy Aquapark, which has 31 slides, wave pool, 400-metre long lazy river, the biggest children’s pool in Turkey, ‘Pirate’s Ship’ with 6 slides and interactive toys and ‘Submarine Octopus’ slide complex. The hotel also offers huge outdoor swimming pools with whirlpool, heated indoor pools, kids’ pools with slides and sand playground. The property is also close to the beach and allows guests to enjoy water sports. 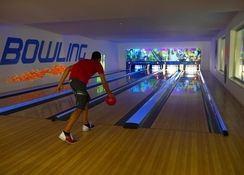 There are also outdoor sports that include water polo, beach volleyball, football, tennis, archery and water gym, while the indoor games room offers bowling, snookers, billiards, darts, and table tennis. The on-site fitness centre comes with a fully equipped gym, yoga, Pilates and Zumba. For relaxation, check into the spa that provides a wide range of massages, sauna, Turkish bath and various body and facial treatments. Children between the ages of 4 and 12 years can join the mini club where a wide range of games and activities are conducted by an expert team. In the evening, entertainment shows and performances take place in the amphitheatre.